The world of technology is constantly advancing and evolving, paving the way for a catalogue of new and exciting gadgets. Each year, a whole host of technology-focused gadgets crop up on our radar, opening our eyes to the endless possibilities that come hand in hand with technology – nothing surprises us anymore when it comes to mind-boggling innovation. And in terms of high-performance gadgets, 2015 really was a great year! From the swegway trend that continues to be on the top of everyone’s Christmas list to smart watches, 2015 saw the gadget industry push the boundaries of innovation to bring us a whole host of exciting gadgets that are perfectly equipped to enhance everyday processes, whilst injecting a generous dose of fun into our lives. So, as we approach 2016, we’ve looked back at some of the gadgets that took 2015 by storm and we’re sure you’ll agree that it was an awe-inspiring year in the gadget world. This year was all about embracing the Apple Watch Sport. And, like all Apple products, it really is unsurprising that this nifty little gadget looks as great as it performs. Armed with everything you would expect from a smart watch and activity tracker, this forward thinking smart watch comes complete with a whole host of innovative features including the ability to track workouts and everyday activity, as well as allowing you to access to your smartphone notifications when you’re on the go. Available in a wide selection of colours and bands, this is a watch that is more than capable of meeting the demands of everyday life. See them in the Apple store. One of 2015’s must have gadgets; Swegways have to be one of the coolest ways of getting around! Of course, their popularity also increased when a whole host of celebrities was spotted test-driving these super cool gadgets. From Brooklyn Beckham and Kendal Jenner through to Justin Bieber, they certainly are the gadget of the moment. Inspired by the larger versions of the Segway, minus the handle, this futuristic way of getting from A to B is basically a mini version of the Segway. But their compact size doesn’t mean that they compromise on performance – far from it. Utilising the very latest technology, they move by detecting the slightest change in pressure from your feet, allowing them to move in all directions – pretty cool, right? They can even spin a whole 360 degrees! See them on Swegways HQ. Recommended reading: Evolution of Electric Scooter. Drones are fast becoming the ultimate way to capture jaw-dropping aerial videos and photos and it’s fair to say that they are one of 2015’s hottest gadgets. Although they can be pretty intimidating, particularly for newcomers, drones are super easy and safe to navigate and control – all from the convenience of an App. The Parrot Bebop 2 Drone also optimises flight time and performance by offering a larger battery life and far more efficient motor. Trust us, if you’re looking to capture high-impact visuals from the air, this is a product that will not disappoint. See it here. In our gadget-obsessed world, you’ll be hard pushed to find a person that doesn’t own the latest smartphone, tablet, smartwatch or other everyday gadgets! However, with so many gadgets constantly at our fingertips, it can often be a massive inconvenience to have to carry all of your chargers around with you – not anymore! 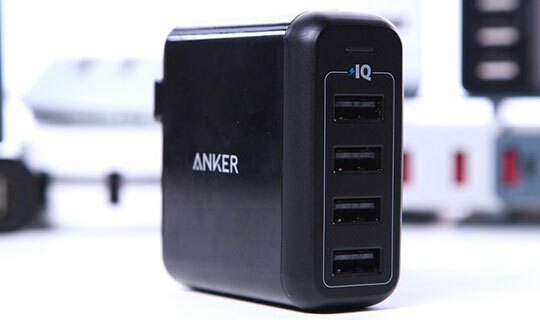 This super versatile and practical Anker Power Port 4 USB Charger allows you to plug your all of your assorted USB cables into one compact, multi-purpose charger! Designed to consolidate all of your wires into one place, this plug in the wall device is perfect for charging all of your favourite gadgets at home, work or when you are out and about. See it here. This is another must have gadget from Apple. Let’s face it, renowned as being leaders in gadget innovation, were you really expecting our list not to feature at least two products from them? And the highly anticipated Apple TV Set-Top Box certainly lives up to expectation. Designed to allow you to effortlessly stream interactive programs, videos and games from the convenience of one compact box, this high-performance streaming device has certainly signalled the future of TV innovation. Embracing the very latest TV interaction, this practical device comes complete with a remote control that responds to voice commands, as well as a touchpad that makes the device super easy to use. Some might even say that it has the power and appeal to even replace our everyday TV subscriptions! See it on the Apple website. So there you have our top 5 gadgets of 2015. As technology continues to advance at an unprecedented rate, which knows what 2016 will bring!